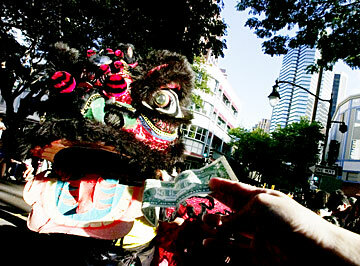 A bystander held out a dollar bill yesterday to lion dancers for good luck at the Chinese New Year's Parade on Hotel Street. The parade and the Night in Chinatown event, which featured Chinese crafts, food and entertainment, kicked off the Year of the Dog celebration. Various travel industry volunteers and students in the University of Hawaii travel industry management program participated yesterday in a painting bee to spruce up George Hall, the building where the program is located.